At least 50 cases of vaccine-derived polio virus (VDPV) have surfaced in the past six years, the recent finding in Telangana being one among them. An article published in Indian Pediatrics, a journal, last year says that since 2009 India has witnessed 41 cases of VDPVs, including two in 2014. The article was written by Manoj Grover from NITI Aayog and Nidhi Bhatnagar from the Army College of Medical Science, New Delhi. On Wednesday, the Ministry of Health and Family Welfare (MoHFW) said a total of 14 sewage samples collected between January 2015 and May 2016 had tested positive for VDPVs. These samples were collected from different parts of the country, a MoHFW statement said, highlighting the fact that none of these VDPVs detected in sewage had infected any children so far. VDPVs are a rare strain of polio viruses that have genetically mutated from the strain contained in the oral polio vaccine (OPV). As per the Polio Global Eradication Initiative, a world community effort, the OPV contains a live, attenuated (weakened) vaccine-virus. When a child is vaccinated, the weakened vaccine-virus replicates in the intestine and enters the bloodstream, triggering a protective immune response in the child. Like wild poliovirus, the child excretes the vaccine-virus for a period of six to eight weeks. As it is excreted, some of the vaccine virus may no longer be the same as the original vaccine virus, as it has genetically altered during replication. This is called a vaccine-derived poliovirus. It adds that paralysis cases due to VDPVs are rare, as the muted virus has to circulate in the under-immunised community for a long period of time. The health ministry added that the detection of VPDVs does not change the polio-free status of the country. It only indicates the robustness of the surveillance system and willingness of the country to detect any kind of polio virus even from the environment. Countering the media report which says police virus re-emerges after five years, the ministry said that it was not true as the detected polio virus strain is VDPV in a sewage sample collected near the Secunderabad railway station. No children have been found to be affected by the detected VDPV isolate in the nearby areas. 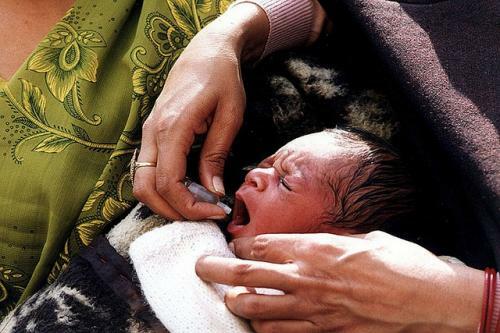 The last case of wild polio virus type 2 in country was reported in 1999. Even the last case of wild polio virus was witnessed on January 13, 2011. However, as a precautionary measure against polio, a special immunisation drive will be being held, covering high-risk areas of Hyderabad and Rangareddy districts. Starting June 20, an estimated 300,000 children will be protected against polio using Inactivated Polio Vaccine. The special immunisation campaign will ensure that all vulnerable children living in high-risk areas are given protection against polio. Children between the age group of six weeks and three years will be given an additional dose of the injectable polio vaccine.